NRQ1: Do you use the Internet? and NRQ4: Have you ever heard of Wikipedia? NRQ7: How often do you use Wikipedia? In 2016, Issa Rice and I conducted several surveys of Wikipedia usage. We collected survey responses from Slate Star Codex readers, Vipul’s Facebook friends, and a few United States audiences through SurveyMonkey Audience and Google Surveys (known at the time as Google Consumer Surveys). Our survey questions measured how heavily people use Wikipedia, what sort of pages they read or expected to find, the relation between their search habits and Wikipedia, and other actions they took within Wikipedia. The surveys are part of our work to understand the impact of contributing to Wikipedia. Both of us regularly contribute to the site, and we are also getting more people to work on editing and adding content to Wikipedia. Therefore we want to understand how people use Wikipedia, how much they use Wikipedia, what types of people tend to use Wikipedia, and so on, so that we can direct efforts more strategically. The gap between elite samples of Wikipedia users and general United States Internet users is significantly greater than the gap between the different demographics within the United States that we measured. This post goes over the survey questions, the responses of participants, and other survey data (specifically, data from the New Readers surveys by the Wikimedia Foundation) and then explains the takeaways. At the end of May 2016, Issa Rice and I created a Wikipedia usage survey on SurveyMonkey to gauge the usage habits of Wikipedia readers and editors. SurveyMonkey allows the use of different “collectors” (i.e. survey URLs that keep results separate), so we circulated several different URLs among four locations to see how different audiences would respond. SurveyMonkey’s United States audience with no demographic filters (62 responses, 54 of which are full responses). We will refer to this audience as SM, or S1SM if needed to avoid ambiguity. My Facebook timeline (post asking people to take the survey; 70 responses, 69 of which are full responses). For background on the timeline audience, see my page on how I use Facebook. We will refer to this audience as “Vipul’s Facebook friends” or V for short. The Wikipedia Analytics mailing list (email linking to the survey; 7 responses, 6 of which are full responses). Note that due to the small size of this group, the results below should not be trusted, unless possibly when the votes are decisive. We will refer to this audience as AM. Slate Star Codex (post that links to the survey; 618 responses, 596 of which are full responses). We will refer to this audience as SSC. While Slate Star Codex isn’t the same as LessWrong, we think there is significant overlap in the two sites’ audiences (see e.g. the recent LessWrong diaspora survey results). In addition, although not an actual audience with a separate URL, several of the tables we present below will include an “H” group; this is the heavy users group of people who responded by saying they read 26 or more articles per week on Wikipedia. This group has 179 people: 164 from Slate Star Codex, 11 from Vipul’s timeline, and 4 from the Analytics mailing list. We ran the survey from May 30 to July 9, 2016 (although only the Slate Star Codex survey had a response past June 1). For reference, here are the survey questions for the first survey. A dummy/mock-up version of the survey can be found here: https://www.surveymonkey.com/r/PDTTBM8. This survey is intended to gauge Wikipedia use habits. This survey has 3 pages with 5 questions total (3 on the first page, 1 on the second page, 1 on the third page). Please try your best to answer all of the questions, and make a guess if you’re not sure. How many distinct Wikipedia pages do you read per week on average? On a search engine (e.g. Google) results page, do you explicitly seek Wikipedia pages, or do you passively click on Wikipedia pages only if they show up at the top of the results? For the SurveyMonkey audience, there were also some demographic questions (age, gender, household income, US region, and device type). These questions were not filled by respondents at the time of the survey, but rather, are filled in by respondents in order to be able to participate in these surveys. You can learn more on the SurveyMonkey Contribute page. After we looked at the survey responses on the first day, Issa and I decided to create a second survey to focus on the parts from the first survey that interested us the most. SurveyMonkey’s US audience with no demographic filters (54 responses). SurveyMonkey’s US audience with the following filters: ages 18–29 with a college or graduate degree (50 responses). We first ran the survey on the unfiltered audience again because the wording of our first question was changed and we wanted to have the new baseline. We then chose to filter for young college-educated people because our prediction was that more educated people would be more likely to read Wikipedia. The SurveyMonkey demographic data does not include education, and we hadn’t seen the Pew Internet Research surveys in the next section, so we were relying on our intuition and some demographic data from past surveys) for the “college-educated” part. Our selection of the age group was based on the fact that young people in our first survey gave more informative free-form responses in survey 2 (SurveyMonkey’s demographic data does include age). For reference, here are the survey questions for the second survey. A dummy/mock-up version of the survey can be found here: https://www.surveymonkey.com/r/28BW78V. This survey is intended to gauge Wikipedia use habits. Please try your best to answer all of the questions, and make a guess if you’re not sure. This survey has 4 questions across 3 pages. In this survey, “Wikipedia page” refers to a Wikipedia page in any language (not just the English Wikipedia). How many distinct Wikipedia pages do you read (at least one sentence of) per week on average? What are some of the Wikipedia articles you have most recently read (at least one sentence of)? Feel free to consult your browser’s history. Recall a time when you were surprised that a topic did not have a Wikipedia page. What were some of these topics? As with the SurveyMonkey Audience responses for S1, the responses for S2 also came with demographic information that the respondents had previously filled in. We ran a third survey on Google Surveys (known at the time as Google Consumer Surveys) with a single question that was a word-to-word replica of the first question from the second survey. The main motivation here was that on Google Surveys, a single-question survey costs only 10 cents per response, so it was possible to get to a large number of responses at relatively low cost, and achieve more confidence in the tentative conclusions we had drawn from the SurveyMonkey surveys. We bought 500 responses at 10 cents per response, for a total acquisition cost of $50. The responses were from a general United States audience. GS uses a “surveywall” methodology to collect survey responses: the survey questions are shown to people who want to access a piece of content (article or video) and they need to answer the question to access it. Overall, Google Surveys in the United States is reasonably close to representative of the voting US population and the Internet-using population. Also, the sample size of the survey was largest. Therefore, among the surveys we did, this survey comes closest to approximating the behavior of the Internet-using population in the United States. You can learn more at the Wikipedia page for Google Surveys. This survey had exactly one question. The wording of the question was exactly the same as that of the first question of the second survey. One slight difference was that whereas in the second SurveyMonkey survey, the order of the options was fixed, the Google Surveys survey did a 50/50 split between that order and the exact reverse order. Such splitting is a best practice to deal with any order-related biases, while still preserving the logical order of the options. You can read more on the questionnaire design page of the Pew Research Center. The GS responses come with inferred demographic and geographic data (age, gender, income level, location). The geographic data is generally reliable because it is based on IP address, but inferred age and gender data is not as reliable as the self-reported data that we get from SurveyMonkey Audience. For more on the accuracy of the inferred data, see the Pew Research Center’s comparison. In late 2016, the Wikimedia Foundation’s Global Reach team published the results of New Readers phone surveys. The questions in these surveys have some overlap with the questions in our surveys, so we have updated our post to include a discussion of these surveys and how the results compare with ours. The NR surveys were conducted in the following five countries: Nigeria (2768 responses), India (9235 responses), Mexico (2568 responses), Brazil (5343 responses), and Egypt (3976 responses). The surveys were conducted by phone. For the first three countries (Nigeria, India, and Mexico), results of additional in-person surveys have also been published. We were not able to find information on the cost of the surveys, but considering the large audience size (23,890 in total), the survey length, and the labor-intensive method of conducting the survey, we estimate that it cost tens of thousands of dollars. For comparison, an article about survey firm GeoPoll suggests that $10 per response is a fairly good rate for conducting surveys in some African countries. We will compare the results of our surveys with the results of the New Readers surveys. To shed light on this comparison, we include below the list of questions in the New Readers phone survey. Not all questions were presented in all surveys. The Egypt survey, which is the more recent, had the longest list of questions, and we provide this list below. The numbering is mostly based on the Egypt survey, though off by one for later questions due to a question missing from the Egypt survey. Our later analysis will focus on the first, fourth, and seventh question, which are together comparable against the first question of S1, S2, and GS. Have you ever heard of Wikipedia? Where did you find out about Wikipedia? What do you use Wikipedia for? Can you use the Internet with your phone? How do you access the Internet on your phone? What is your usual network speed? Do you download and use Apps? The 2010 Wikipedia survey by the Collaborative Creativity Group and the Wikimedia Foundation. The explanation before the bottom table on page 7 of the overview PDF has “Contributors show slightly but significantly higher education levels than readers”, which provides weak evidence that more educated people are more likely to engage with Wikipedia. Pew Internet Research’s 2007 survey. There is also the New Readers survey mentioned earlier, that we examine in detail in this post. Issa and I ultimately want to get a better sense of the value of a Wikipedia pageview (one way to measure the impact of content creation), and one way to do this is to understand how people are using Wikipedia. As we focus on getting more people to work on editing Wikipedia – thus causing more people to read the content we pay and help to create – it becomes more important to understand who is reading the content, and how they engage with it. What are the various parameters that affect the value of a pageview? 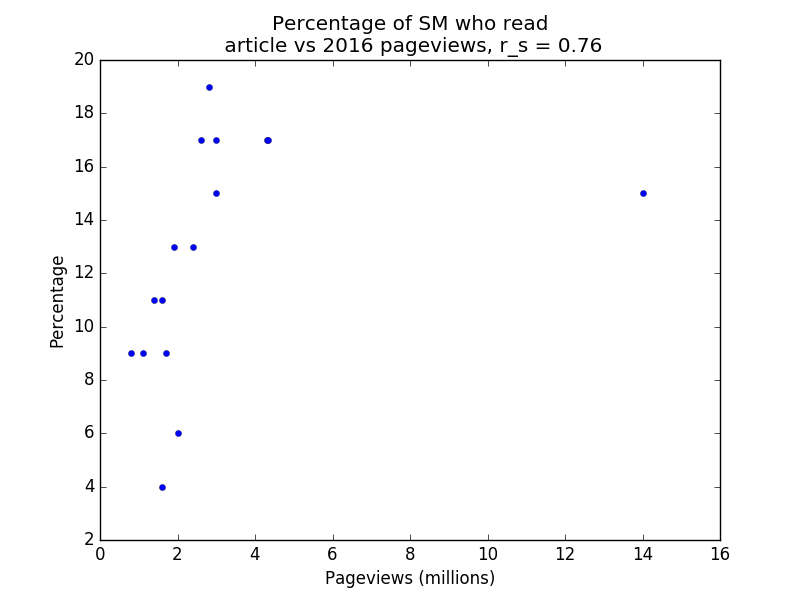 What’s the relative social value of 1 Quora pageview (as measured by Quora stats http://www.quora.com/stats/) and 1 Wikipedia pageview (as measured at, say, Wikipedia article traffic statistics)? Wikipedia allows relatively easy access to pageview data (especially by using tools developed for this purpose, including one that I made), and there are some surveys that provide demographic data (see “Other surveys” above). However, after looking around, it was apparent that the kind of information our survey was designed to find was not available. This was before the New Readers survey results had been published. In this section we present the highlights from each of the survey questions. If you prefer to dig into the data yourself, there are also some exported PDFs below provided by SurveyMonkey. Most of the inferences can be made using these PDFs, but there are some cases where additional filters are needed to deduce certain percentages. For the SurveyMonkey surveys, we use the notation “SnQm” to mean “survey n question m”. The Google Surveys survey question is referred to as GS, and the New Readers questions are referred to with the notation “NRQm” for question m of the survey. Here is a table that summarizes the data for Q1. Note that SMM and SMF don’t add up to SM as some respondents did not specify their gender. How many distinct Wikipedia pages do you read per week on average? SM = SurveyMonkey audience, V = Vipul Naik’s timeline, SSC = Slate Star Codex audience, AM = Wikipedia Analytics mailing list, SMM = SurveyMonkey males, SMF = SurveyMonkey females. The “pgs/wk lower” is obtained as the average pages read per week if everybody read at the lower end of their estimate (so the respective estimates are 0, 1, 11, and 26). The “pgs/wk upper” is obtained as the average of pages read per week if everybody read at the upper end of their estimate, except the “26 or more” case where we assume a value of 50 (so the respective estimates are 1, 10, 25, and 50). We choose 50 as a reasonable upper bound on what the average person who views more than 26 pages likely views, rather than a strict bound on every individual. Having these ranges makes it easier to quickly compare different audiences. The (very approximate) estimates of pages/week can be validated against known information about total pageviews. The comments indicated that S1Q1 was flawed in several ways: we didn’t specify which language Wikipedias count nor what it meant to “read” an article (the whole page, a section, or just a sentence?). One comment questioned the “low” ceiling of 26; however, the actual distribution of responses suggests that the ceiling wasn’t too low. An interesting potential modification of the survey would be to ask further questions of people who selected an extreme response, to better bucket them. We asked Q2, “On a search engine (e.g. Google) results page, do you explicitly seek Wikipedia pages, or do you passively click on Wikipedia pages only if they show up at the top of the results?”, to see to what extent people preferred Wikipedia in search results. The main implication to this for people who do content creation on Wikipedia is that if people do explicitly seek Wikipedia pages (for whatever reason), it makes sense to give them more of what they want. On the other hand, if people don’t prefer Wikipedia, it makes sense to update in favor of diversifying one’s content creation efforts while still keeping in mind that raw pageviews indicate that content will be read more if placed on Wikipedia (see for instance Brian Tomasik’s experience, which is similar to my own, or gwern’s page comparing Wikipedia with other wikis). The following table summarizes our results. Wikipedia has been shortened to WP to conserve column width. On a search engine (e.g. Google) results page, do you explicitly seek Wikipedia pages, or do you passively click on Wikipedia pages only if they show up at the top of the results? SM = SurveyMonkey audience, V = Vipul Naik’s timeline, SSC = Slate Star Codex audience, AM = Wikipedia Analytics mailing list, H = heavy users (26 or more articles per week) of Wikipedia. An oversight on our part was not to include an option for people who avoided Wikipedia or did something else. This became apparent from the comments. For this reason, the “Just click on top results” options might be inflated. In addition, some comments indicated a mixed strategy of preferring Wikipedia for general overviews while avoiding it for specific inquiries, so allowing multiple selections might have been better for this question. This question is relevant for us because the work we fund is mainly whole-page creation. If people are mostly reading the introduction or a particular section like the “Criticisms” or “Reception” section (see S1Q5), then that forces us to consider spending more time on those sections, or to strengthen those sections on weak existing pages. Responses to this question were fairly consistent across different audiences, as can be see in the following table. Do you usually read a particular section of a page or the whole article? SM = SurveyMonkey audience, V = Vipul Naik’s timeline, SSC = Slate Star Codex audience, AM = Wikipedia Analytics mailing list, H = Heavy users (26 or more articles per week) of Wikipedia, SMM = SurveyMonkey males, SMF = SurveyMonkey females. People were allowed to select more than one option for this question. The comments indicate that several people do a combination, where they read the introductory portion of an article, then narrow down to the section of their interest. We asked about whether people use the search functionality on Wikipedia because we wanted to know more about people’s article discovery methods. The data is summarized in the following table. How often do you use the search functionality on Wikipedia? SM = SurveyMonkey audience, V = Vipul Naik’s timeline, SSC = Slate Star Codex audience, AM = Wikipedia Analytics mailing list, H = heavy users (26 or more articles per week) of Wikipedia, SMM = SurveyMonkey males, SMF = SurveyMonkey females. Many people noted here that rather than using Wikipedia’s search functionality, they use Google with “wiki” attached to their query, DuckDuckGo’s “!w” expression, or some browser configuration to allow a quick search on Wikipedia. To be more thorough about discovering people’s content discovery methods, we should have asked about other methods as well. We did ask about the “See also” section in S1Q5. Next, we asked how often people are surprised that there is no Wikipedia page on a topic to gauge to what extent people notice a “gap” between how Wikipedia exists today and how it could exist. We were curious about what articles people specifically found missing, so we followed up with S2Q4. How often are you surprised that there is no Wikipedia page on a topic? SM = SurveyMonkey audience, V = Vipul Naik’s timeline, SSC = Slate Star Codex audience, AM = Wikipedia Analytics mailing list, H = heavy users (26 or more articles per week) of Wikipedia, SMM = SurveyMonkey males, SMF = SurveyMonkey females. Two comments on this question (out of 59) – both from the SSC group – specifically bemoaned deletionism, with one comment calling deletionism “a cancer killing Wikipedia”. This question was intended to gauge how often people perform an action for a specific page; as such, the frequencies are expressed in page-relative terms. The following table presents the scores for each response, which are weighted by the number of responses. The scores range from 1 (for every page) to 5 (never); in other words, the lower the number, the more frequently one does the thing. For what fraction of pages you read do you do the following? Note that the responses have been shortened here; see the Questions for S1 section for the wording used in the survey. Responses are sorted by the values in the SSC column. SM = SurveyMonkey audience, V = Vipul Naik’s timeline, SSC = Slate Star Codex audience, AM = Wikipedia Analytics mailing list, H = heavy users (26 or more articles per week) of Wikipedia, SMM = SurveyMonkey males, SMF = SurveyMonkey females. The table above provides a good ranking of how often people perform these actions on pages, but not the distribution information (which would require three dimensions to present fully). In general, the more common actions (scores of 2.5–4) had responses that clustered among “For some pages”, “For very few pages”, and “Never”, while the less common actions (scores above 4) had responses that clustered mainly in “Never”. One comment (out of 43) – from the SSC group, but a different individual from the two in S1Q4 – bemoaned deletionism. Note the wording changes from S1Q1: “less” was changed to “fewer”, the clarification “at least one sentence of” was added, and we explicitly allowed any language. (The explicit allowing of any language was in the introduction to the survey and not part of the question itself). We have also presented the survey 1 results for the SurveyMonkey audience in the corresponding rows, but note that because of the change in wording, the correspondence isn’t exact. How many distinct Wikipedia pages do you read (at least one sentence of) per week on average? SM = SurveyMonkey audience with no demographic filters, CEYP = College-educated young people of SurveyMonkey, S1SM = SurveyMonkey audience with no demographic filters from the first survey, SMM = SurveyMonkey males, SMF = SurveyMonkey females, CEYPM = College-educated young males of SurveyMonkey, CEYPF = College-educated young females of SurveyMonkey. The “pgs/wk lower” is obtained as the average pages read per week if everybody read at the lower end of their estimate (so the respective estimates are 0, 1, 11, and 26). The “pgs/wk upper” is obtained as the average of pages read per week if everybody read at the upper end of their estimate, except the “26 or more” case where we assume a value of 50 (so the respective estimates are 1, 10, 25, and 50). For more, see the S1Q1 explanation. Comparing SM with S1SM, we see that probably because of the wording, the percentages have drifted in the direction of more pages read. It might be surprising that the young educated audience seems to have a smaller fraction of heavy users than the general population. However note that each group only had ~50 responses, and that we have no education information for the SM group. Our intention with this question was to see if people’s stated or recalled article frequencies matched the actual, revealed popularity of the articles. 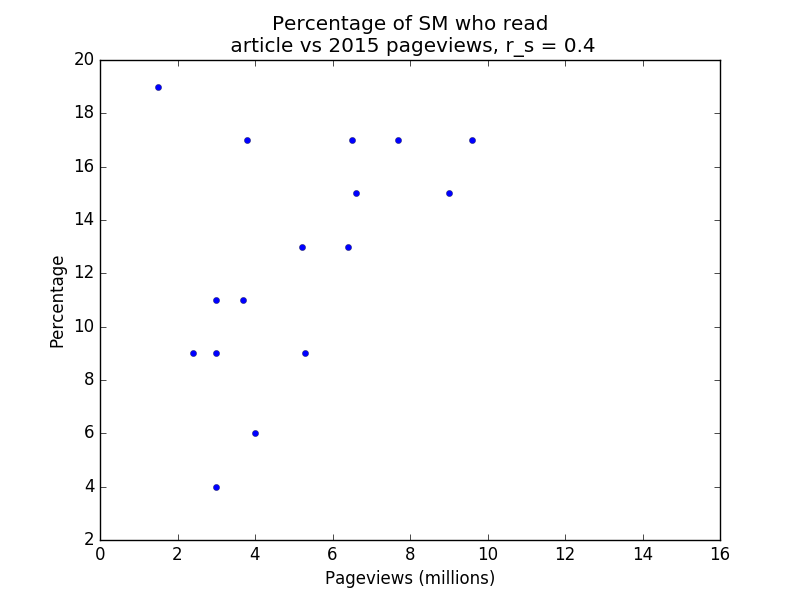 Therefore we present the pageview data along with the percentage of people who said they had read an article. Which of these articles have you read (at least one sentence of) on Wikipedia (select all that apply)? SM = SurveyMonkey audience with no demographic filters, CEYP = College-educated young people of SurveyMonkey. Columns “2016” and “2015” are desktop pageviews in millions. Note that the 2016 pageviews only include pageviews through the end of June. The rows are sorted by the values in the CEYP column followed by those in the SM column. Below are four plots of the data. Note that r_s denotes Spearman’s rank correlation coefficient. Spearman’s rank correlation coefficient is used instead of Pearson’s r because the former is less affected by outliers. Note also that the percentage of respondents who viewed a page counts each respondent once, whereas the number of pageviews does not have this restriction (i.e. duplicate pageviews count), so we wouldn’t expect the relationship to be entirely linear even if the survey audiences were perfectly representative of the general population. As with the previous question, the most common response was along the lines of “None”, “I don’t know”, “I don’t remember”, “Doesn’t happen”, or similar. The most useful responses were classes of things: “particular words”, “French plays/books”, “Random people”, “obscure people”, “Specific list pages of movie genres”, “Foreign actors”, “various insect pages”, and so forth. The survey was circulated to a target size of 500 in the United States (no demographic filters), and received 501 responses. Since there was only one question, but we obtained data filtered by demographics in many different ways, we present this table with the columns denoting responses and the rows denoting the audience segments. We also include the S1Q1SM, S2Q1SM, and S2Q1CEYP responses for easy comparison. Note that S1Q1SM did not include the “at least one sentence of” caveat. We believe that adding this caveat would push people’s estimates upward. If you view the Google Surveys results online you will also see the 95% confidence intervals for each of the segments. Note that percentages in a row may not add up to 100% due to rounding or due to people entering “Other” responses. For the entire GS audience, every pair of options had a statistically significant difference, but for some subsegments, this was not true. How many distinct Wikipedia pages do you read (at least one sentence of) per week, on average? SM = SurveyMonkey Audience, GS = Google Surveys, SMM = SurveyMonkey males, SMF = SurveyMonkey females. The “pgs/wk range” is obtained as follows. The lower bound is obtained as the average pages read per week if everybody read at the lower end of their estimate (so the respective estimates are 0, 1, 11, and 26). The upper bound is obtained as the average of pages read per week if everybody read at the upper end of their estimate, except the “26 or more” case where we assume a value of 50 (so the respective estimates are 1, 10, 25, and 50). For more, see the S1Q1 explanation. We can see that the overall GS data vindicates the broad conclusions we drew from SurveyMonkey data. Moreover, most GS segments with a sufficiently large number of responses (50 or more) display a similar trend as the overall data. One exception is that younger audiences seem to be slightly less likely to use Wikipedia very little (i.e. fall in the “Fewer than 1” category), and older audiences seem slightly more likely to use Wikipedia very little. Using the country breakdown data for traffic to Wikipedia, we see that Wikipedia received 3.54 billion views in the United States for a recent 30-day period, which translates to about 827 million weekly pageviews. Estimates for the number of active Internet users in the United States vary, based on definition, between 150 million and 290 million. With these estimates, we get a range of 2.85–5.51 for the number of pageviews per week for a United States user. We see that this range is loosely within the range for the SurveyMonkey surveys as well as Google Surveys. In other words, the survey data is loosely plausible and consistent with known facts. Both questions were asked in the New Readers phone survey for all five countries. NRQ1 was the same across all countries (though for Egypt, the “No” responses were further split to separate people who used Facebook). NRQ4 was asked as Q3 in Nigeria, Mexico, and Brazil. We additionally want to know the percentage of Internet users who have heard of Wikipedia, as this will be useful later when making estimates of total pages/week read by people. We don’t directly know this number. However, if we assume that the people who have heard of Wikipedia are a subset of the people who use the Internet, then we can compute this percentage as the ratio of the percentage of Yes responses to NRQ4 and NRQ1. This assumption is a reasonable proxy for reality, so we will use the ratio as a stand-in for the percentage of Internet users who have heard of Wikipedia. New Readers question responses. NRQ1 = Do you use the Internet? NRQ4 = Have you heard of Wikipedia? An interesting note of comparison: for the surveys we circulated, we did not even ask people if they had heard of Wikipedia. The implicit assumption was that people had heard of Wikipedia. This assumption was probably reasonable in the contexts we operated in, and it didn’t make sense to waste a question (and the underlying survey costs) on getting that information. This question was in all country surveys, though at different positions. The respondents to this question appear to have been selected as only the ones who had heard of Wikipedia. How often do you use Wikipedia? N values represent respondents to the question. The pgs/wk range is calculated as follows. For daily use, we assume between 4 and 50 views a week. For weekly use, we assume between 1 and 5 views a week. For monthly use, we assume between 0.2 and 1 view a week. We do not count any contribution for “Rarely” and “Never”. How often do you use Wikipedia? N values represent respondents to the survey. Those who did not respond to the question are placed in the Never category. Next, we do the same calculation, but now use our denominator as the number of people who use the Internet. This is the closest in spirit to the audience for SurveyMonkey Audience and Google Surveys in the United States, though the selection dynamic does differ quite a bit. How often do you use Wikipedia? N values represent respondents to the survey who use the Internet? Those who use the Internet but did not respond to this question are placed in the Never category. The combin can be compared with S1Q1, S2Q1, and GS. However, the buckets presented to users were very different. The potential correspondence is below. Fewer than 1: This corresponds to Monthly, Rarely, and Never. 1 to 10: This corresponds to Weekly and a subset of Daily. 11 to 25: This mostly corresponds to Daily. 26 or more: This mostly corresponds to Daily. The data show that the people surveyed read Wikipedia less than the SurveyMonkey Audience and Google Surveys audiences. The total of the Monthly, Rarely, and Never columns for each of the five countries is over 70%, and it is over 80% for all countries other than Mexico. The corresponding “Fewer than 1” percentage for each iteration of urveyMonkey Audience and Google Surveys is less than 50%, and even on subsegments it is less than 60%. In other words, the surveys suggest that Wikipedia use is less in the five countries than in the United States. We get the estimate for weekly traffic by scaling from 30 days to 7 days the country breakdown data. Data was captured on December 23, 2016. We get Internet-using population estimates from the Wikipedia page, which in turn relies on Internet Live Stats. Estimates were captured on December 23, 2016. We use this data rather than the data from stats.wikimedia.org since this data is more up to date, and includes extrapolated estimates rather than the most recent confirmed estimate. Internet user and weekly pageview counts are in the millions. The range is the one computed based on the Internet-using population. We see that the pgs/wk number is a little lower than the range for the case of Nigeria and India, with the gap particularly huge in Nigeria. Otherwise, however, the ranges are plausible and so the pageview data loosely validates the survey results. SurveyMonkey allows exporting of response summaries. Here are the exports for each of the audiences. The Google Surveys survey results are available online at https://www.google.com/insights/consumersurveys/view?survey=o3iworx2rcfixmn2x5shtlppci&question=1&filter=&rw=1. The most striking finding to us was just how wide the gap is between audiences such as Vipul’s Facebook friends and Slate Star Codex on the one hand, and general US Internet users (as measured through SurveyMonkey Audience and Google Surveys) on the other. Here are three different ways to slice the data to confirm the gap between the audiences. Percentage of respondents who view less than 1 Wikipedia page per week: For Vipul’s Facebook friends, Slate Star Codex, and the Analytics mailing list, this was 0% or 1%. In contrast, for all the SurveyMonkey Audience and Google Surveys segments considered, this was 25% or higher, with the most general US audiences and largest sample sizes giving numbers between 40% and 60%. Estimated pages/week range: For Vipul’s friends, Slate Star Codex, and the Analytics mailing list, the lower end was 9 or higher, and the upper end was 19 or higher. In contrast, for all the SurveyMonkey Audience and Google Surveys segments considered, the lower end was less than 5 and the upper end was less than 15. Percentage of respondents who view 26 or more Wikipedia pages per week: For Vipul’s friends, Slate Star Codex, and the Analytics mailing list, the number was 16%, 27%, and 57% respectively. In contrast, for all the SurveyMonkey Audience and Google Surveys segments, this percentage was less than 13%, and for most of the larger segments it was less than 7%. They tend to explicitly seek Wikipedia in search results (S1Q2). They are more likely to be surprised at the absence of a Wikipedia page (S1Q4). They are more likely to use the search functionality witihn Wikipedia (S1Q4). They are considerably more likely to engage with page content in various ways, including looking at the See Also section, sharing the page, focusing on Criticisms and Reception, checking citations, and checking the talk page (S1Q5). They are not too different from the general US audience in terms of the extent to which they read a section versus the whole page (S1Q3). They are not noticeably more likely to engage in editing actions on Wikipedia (in other words, active Wikipedia editors constituted a small fraction of heavy users) (S1Q5). Of the three audiences with a high proportion of heavy Wikipedia users: Vipul’s Facebook friends, Slate Star Codex, and the Wikimedia Analytics mailing list, only the third has an obvious connection with Wikipedia. The first two audiences are not directly linked to Wikipedia, and this is evidenced somewhat by the low rate of Wikipedia editing in these audiences. This suggests that visiting a specific website or being in a specific friend group on social media can be good predictors of heavy Wikipedia use without necessarily predicting Wikipedia editing. It would be interesting to run this survey among audiences of different websites and people in different friend networks to get a better sense of what attributes predict high Wikipedia use. 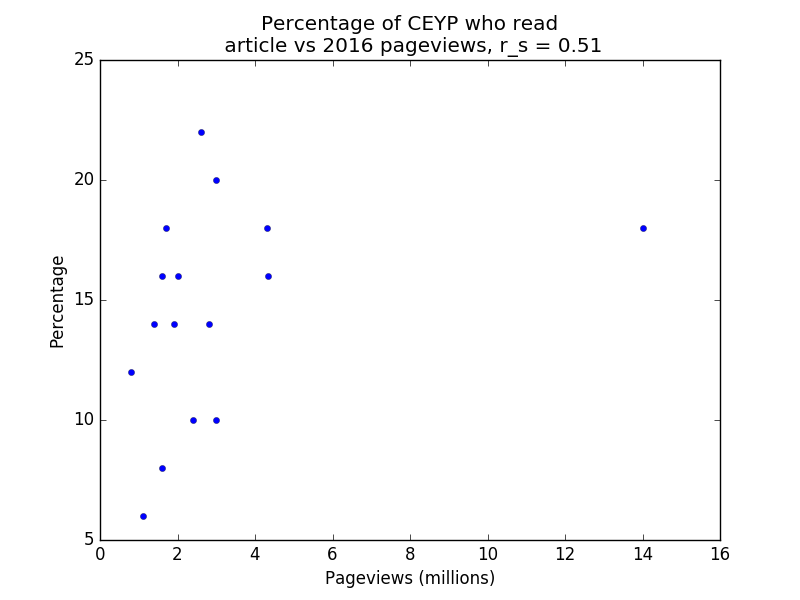 As described in the Motivation section, our interest in the topic stems partly from a desire to quantify the value of individual Wikipedia pageviews. The results we obtained caused us to revise our estimate upward, but with the important caveat of downgrading the reach of Wikipedia. For some pages, the main way it is impactful is if the right set of people read it. For such a page, getting 1,000 pageviews from the right people (the ones with the information, authority, and skill to act on it) is more valuable than getting 1,000 pageviews from people who happen to visit the page accidentally. The qualities we have identified for heavy Wikipedia users around their explicit seeking of Wikipedia as well as their use of advanced features on Wikipedia to verify facts and learn more, give us a little more confidence that pages are being read by the right people who are equipped to take action on them. Additionally, other information we have about the audiences with high proportions of heavy users (specifically, that they are friends with Vipul, read Slate Star Codex, or are on the Analytics mailing list) also give us reason to be optimistic about these readers relative to general Internet users. For some pages and Wikipedia use cases, the impact pathway crucially depends on a lot of people in diverse contexts and life situations reading it. The results we have obtained suggest, very tentatively, that the views on a given page are likely to come from a less diverse audience than we might naively think. For instance, let’s say we go on a spree to significantly improve Wikipedia’s coverage of 100 pages related to healthy living habits, and we then see that the pages we’ve improved got 10 million pageviews collectively. Naively, we might have thought that we were reaching millions of users. However, if a lot of Wikipedia’s pageviews come from heavy users, there’s a good chance that those 10 million pageviews came from a few hundred thousand of these heavy users. For any given page or set of pages, we can only speculate. Therefore, this downgrading is only potential, and is accompanied by considerable uncertainty. S1Q1: 25% of males and 58% of females view less than 1 Wikipedia page per week. S2Q1: 32% of males and 42% of females view fewer than 1 Wikipedia page per week. GS: 41% of males and 52% of females view fewer than 1 Wikipedia page per week. The gaps at the higher end of pages/week were less statistically robust because the percentages were too small, and therefore easily affected by outlier individuals. With that said, the overall pages/week ranges for men were mostly higher than those for women, as expected. The gender gap in reading (which should be distinguished from the gender gap in editing) is consistent with past research on gender differences in Wikipedia reading and also with the surveys mentioned in the Other surveys section. It’s particularly interesting to compare it against the 2007 and 2011 Pew surveys, both of which target a United States audience. In 2011, 56% of males and 50% of females answered Yes to the same question. While it’s a bit hard to sensibly compare these magnitudes with the magnitudes we obtained, the data does directionally support the idea of a gender gap in Wikipedia reading. The gender gap in reading is small compared to the difference with Vipul’s Facebook friends, Slate Star Codex, and the Analytics Mailing List, all of which had 0% or 1% of people viewing less than 1 Wikipedia page per week. Unfortunately, for the three audiences (Vipul’s Facebook friends, Slate Star Codex, and the Analytics mailing list), we do not have gender data for individual respondents. The audiences from which the respondents were drawn are between 60% and 80% male, but it’s plausible that the actual respondents had a gender proportion outside this range. For S1 and S2, the number of people within each age bucket was too small to draw any conclusion. We did notice that on S2, older people were less likely to enter optional comments, but we don’t know why (it could be because of greater difficulty typing rather than anything specific to Wikipedia). For GS, we saw a clear age gradient. In particular, older pepole were more likely to select the “Fewer than 1” option for the number of Wikipedia pages they read per week. Here’s a snippet from the Google Surveys results table showing that. These age differences are broadly in line with common sense: the Internet is used more by people in younger age groups. For Wikipedia in particular, school and college motivate a lot of Wikipedia use. Hence the general summer dip for pageviews to many Wikipedia article; see the American Civil War as an example. The school/college motivation makes Wikipedia more useful to school- and college-age audiences. 2007: 18–29 at 44%, 30–49 at 38%, 50–64 at 31%, 65+ at 26%. 2011: 18–29 at 62%, 30–49 at 52%, 50–64 at 49%, 65+ at 33%. These age differences pale in comparison with the differences with Vipul’s Facebook friends, Slate Star Codex, and the Analytics mailing list, all of which had 1% or less of their users viewing fewer than 1 page per week. Unfortunately, for the three audiences (Vipul’s Facebook friends, Slate Star Codex, and the Analytics mailing list), we do not have age data for individual respondents. The audiences from which the respondents were drawn are mostly in the 18–24, 25–34, and 35–44 age groups. Thus, we see that the gap from the United States average to a heavy user is about the same as the gap from a low-income country to the United States. Here’s another way of thinking about it. Wikipedia as a whole got about 16 billion pageviews over a recent 30-day period. If Internet users everywhere used it as much as they do in the United States (even at current Internet penetration rates) Wikipedia would get around double that many pageviews, or about 32 billion a month. If Internet users everywhere used Wikipedia as much as Slate Star Codex readers, Wikipedia would get between 150 billion and 300 billion pageviews a month (a number comparable to the total number of Google searches performed worldwide). If everybody in the world had Internet connectivity and used Wikipedia as much as Slate Star Codex readers do, Wikipedia would get between 400 billion and 800 billion monthly pageviews. The document and all sources used to compile it are available as a GitHub Gist. The document is also available as a PDF. The source files used to compile the earlier document are available in a GitHub Gist. 2016-08-27: A summary is added to the top of the post. 2016-10-05: Google Surveys (then Google Consumer Surveys) results are added. The current version of the post has been written by me (Vipul Naik), with some feedback from Issa Rice. All errors and imperfections are mine. SurveyMonkey Audience responses are also reported by gender. New Readers survey responses are discussed and compared with existing data. Response data has been compared with known information on total pageviews by country. Explicit takeaways have been added. The reason for publishing this as a fresh post with different authorship is that the changes that were needed were fairly major, and Issa and I were not in full agreement about how to incorporate them into the existing post. This does not include the cost of the New Readers surveys, which were not borne by us, but which are likely in the tens of thousands of dollars. This document is released to the public domain. Linked and referenced material may be subject to its own copyright restrictions. If any, is there a shortlist of alternatives that people use over wikipedia? i.e. people who just go to the first result or who avoid wiki; where do they end up? In my experience, the first link is typically wikipedia if you search for an exact term rather than a question ("What is the capital of italy" vs "Italy capital". the latter puts wiki at the top for me). (a) Google's own answers for simple questions. (b) Transactional websites for search terms that denote possible purchase intent, or other websites that are action-oriented (e.g., Yelp reviews). Stackexchange (or Q&A sites in general) is also a popular hit for me, but that might just be google profiling me. It seems to me like heavy users of Wikipedia are more likely to fill out a survey for Wikipedia users. On the other hand there's no similar filter for the survey monkey audience. Good point! Something I thought a bit about but didn't get around to discussing in this post. The Slate Star Codex audience returned a total of 618 responses. I don't have a very good idea of how many people read the SSC blog carefully enough to go through all the links, but my best guess is that that number is in the low thousands. If that's the case the response rate is 15% or higher. This is still low but not that low. Another way of framing this: how low would the response rate have to be for the true SSC readership to be like the SurveyMonkey Audience or Google Surveys audiences? Based on the numbers it seems like the selection bias would have to be really strong for that to happen. So while I don't think selection for Wikipedia specifically is the driving factor here, it could be that rather than talk about SSC readership, it makes more sense to talk about "SSC readers who are devoted enough and curious enough to read through every link in the link roundup." On a related note, effective response rates for on-site Wikipedia surveys (which we didn't discuss here, but might be the subject of future posts) can be around 0.1% to 0.2%, see for instance Why We Read Wikipedia (to get the response rate you would need to use existing info on the number of pageviews to Wikipedia; I have emailed the researchers and confirmed that the response rate was in that ballpark). Compared to that, the SSC response rate seems pretty high and more definitely informative about the population. It might be possible to get Scott to include the "number of Wikipedia pages read per week" into his next census. That would give more accurate base rates. The annual LessWrong survey might be another place to consider putting it. I don't know who's responsible for doing it in 2017, but when I find out I'll ask them. The 2017 SSC Survey had 5500 respondents. Presumably this survey was more widely visible and available than mine (which was one link in the middle of a long link list). The gap between elite samples of Wikipedia users and general United States Internet users is significantly greater than the gap between the different demographics within the United States that we measured. It is comparable to the gap between United States Internet users and Internet users in low-income countries. I'm still a little surprised at the low effect sizes of demographic differences within the United States. Still, a lot of questions can be raised about the methodology. Other than gender, we didn't really collect large samples for anything. And Google Surveys uses inferred values for age and income for most respondents, so it's probably not that reliable. The Pew Internet surveys offer some independent evidence of the strength of the correlation of Wikipedia use with gender, age, and income, but the questions there are too coarse (just asking people whether they use Wikipedia). Could there be other demographic variables that we didn't explore that could have higher predictive power? I'm still a little surprised at the low effect sizes of demographic differences within the United States. Still, a lot of questions can be raised about the methodology. Other than gender, we didn't really collect large samples for anything. Do you think you should've spent more for larger samples? $325 is really not that much money, especially considering how much time it takes to set up and analyze anything. It's not too late, if I do so decide :). In other words, it's always possible to spend later for larger samples, if that actually turns out to be something I want to do. It'll be pretty expensive: I'd probably want to spend using several different survey tools, since each has its strengths and weaknesses (so SurveyMonkey, Google Surveys, maybe Survata and Mechanical Turk as well). Then with each I'd need 1000+ responses to be able to regress against all variables and variable pairs. The costs do add up quickly to over a thousand dollars. I don't currently have that much uncertainty: It might show that age and income actually do explain a little more of the variation than it seems right now (and that would be consistent with the Pew research). But I feel that we already have enough data to see that it doesn't have anywhere near the effect that SSC membership has. I'm open to arguments to convince me otherwise. Wikipedia consumption is heavily skewed toward a profile of “elite” people, and these people use the site in qualitatively different ways. I didn't talk about it much in the post since it would be too speculative, but I'm interested in more concrete thoughts on predicting what websites or online communities would have a high degree of Wikipedia use. The SurveyMonkey Audience and Google Surveys results plausibly show that crude demographic proxies such as intelligence, education, wealth, income, gender, age, etc. have very little predictive power compared with something like "reads Slate Star Codex and is willing to click to a survey link from there." I wonder what sort of attributes might be most predictive of using Wikipedia a lot. I'd say it's something like "general intellectual curiosity": curiosity of an intellectual kind, but general, across domains, rather than narrowly related to one domain where one can achieve enough mastery so as not to need Wikipedia. I do know of curious people who don't use Wikipedia much, because their curiosity is specific to some domains where they have far surpassed Wikipedia, or Wikipedia doesn't cover well. I wonder what other websites similar to SSC might qualify. Would LessWrong? Wait But Why? EconLog? Overcoming Bias? XKCD? SMBC Comics? I also wonder what friend networks or other online community filters would predict high Wikipedia use. 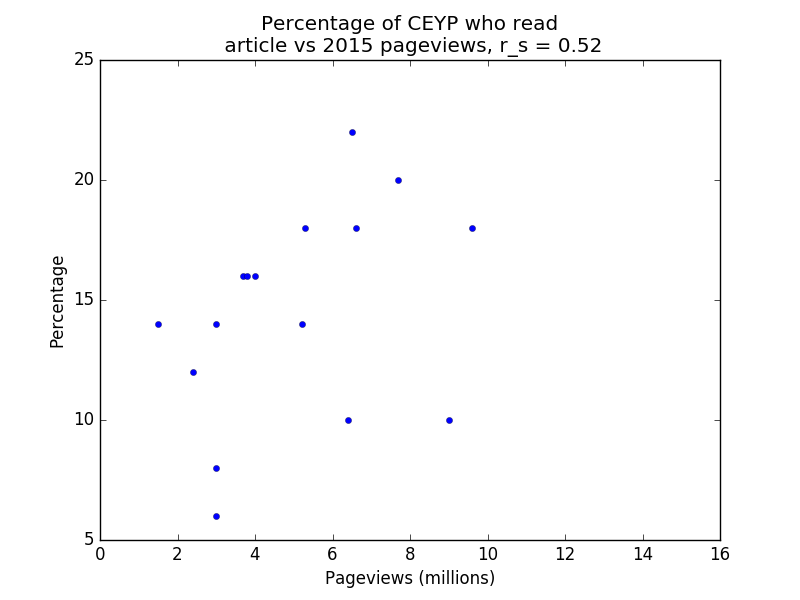 Does being a Yudkowsky follower on Facebook predict high Wikipedia use? What about being in particular subreddits? Try to get datasets (Wikipedia lists, World Bank info, USDA, etc.) as a primary step in thinking about a question. we’ve revised upward our estimate of the impact per pageview, and revised downward our estimate of the broad appeal and reach of Wikipedia. A lot of this comes down to whether the indicators we've identified for heavy Wikipedia use actually are things to be optimistic about. Is the typical SSC or LessWrong reader better able to use information gleaned from Wikipedia? And what about the alleged downside that Wikipedia is being read by fewer people than we might think? How much does that cut into the value of writing pages with hopefully broad appeal? My guess is there is a huge spread in how much people read. SSC and the LessWrong sequences are indigestible if you cannot comfortably stomach 20000 or more words in a day. Lots of people read way less than that! I suspect this is a big part of the reason we're such a high IQ crowd: you have to be super verbal to absorb this stuff! Map and Territory, Consequentialism and even AI risk aren't actually terribly complicated ideas, but we have a tradition of transporting them in long blog posts, and generally a culture of communication that optimizes for precision at the cost of conciseness. I think you've discovered that Wikipedia is similarly more a "verbal elite" thing. My prediction would be that number of books read this year is very highly correlated with Wikipedia use, and number of academic papers read even higher. And both of those I would expect are also highly correlated with SSC / LW readership. I've sat through quite a number of academic presentations that were obviously heavily based on Wikipedia articles (this can be easy to tell in humanities subjects and if you're the person who wrote that article) but not mentioned to be so. I therefore suspect Wikipedia is the most-plagiarized source of information in the world. So I don't think it is that important whether people get information from Wikipedia directly. If they can get information from somebody who got it from Wikipedia, that should be enough. I suspect this is a big part of the reason we're such a high IQ crowd: you have to be super verbal to absorb this stuff! ...I think you've discovered that Wikipedia is similarly more a "verbal elite" thing. Interesting. I suspect that even among verbal elites, there are further splits in the type of consumption. Some people are heavy on reading books since they want a full, cohesive story of what's happening, whereas others consume information in smaller bits, building pieces of knowledge across different domains. The latter would probably use Wikipedia more. Similarly, some people like opinion-rich material whereas others want factual summaries more. The factual summary camp probably uses Wikipedia more. However, I don't know if there are easy ways of segmenting users, i.e., I don't know if there are websites or communities that are much more dominated by users who prefer longer content, or users who prefer factual summaries.